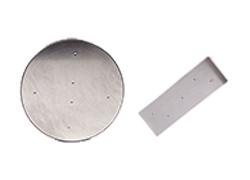 Newage® test blocks for Brinell testing are made of the highest quality steel and aluminum. They provide you with an easy and inexpensive way to verify your Brinell testing system. Brinell blocks serve as precision references, standardized to provide the average hardness of the block surface. Our Brinell blocks are supplied with a nominal value and tolerance. We offer a variety of scales and blocks, including Yamamoto types, available for immediate delivery. Plus, we can help with custom blocks. Each Brinell test block is verified in accordance to ASTM-E10. Scale: HB15, Value: 45, Variation: +/-25, Test Load / Ball: 1500kg / 10 mm, Block Size (diameter): 2" x 5-7/8"
Scale: HB15, Value: 135, Variation: +/-25, Test Load / Ball: 1500kg / 10 mm, Block Size (diameter): 2" x 5-7/8"
Scale: HB15, Value: 200, Variation: +/-25, Test Load / Ball: 1500kg / 10 mm, Block Size (diameter): 2" x 5-7/8"
Scale: HB30, Value: 150, Variation: +/-25, Test Load / Ball: 3000kg / 10 mm, Block Size (diameter): 2" x 5-7/8"
Scale: HB30, Value: 200, Variation: +/-25, Test Load / Ball: 3000kg / 10 mm, Block Size (diameter): 2" x 5-7/8"
Scale: HB30, Value: 250, Variation: +/-25, Test Load / Ball: 3000kg / 10 mm, Block Size (diameter): 2" x 5-7/8"
Scale: HB30, Value: 300, Variation: +/-25, Test Load / Ball: 3000kg / 10 mm, Block Size (diameter): 2" x 5-7/8"
Scale: HB30, Value: 350, Variation: +/-25, Test Load / Ball: 3000kg / 10 mm, Block Size (diameter): 2" x 5-7/8"
Scale: HB30, Value: 400, Variation: +/-25, Test Load / Ball: 3000kg / 10 mm, Block Size (diameter): 2" x 5-7/8"
Scale: HB30, Value: 450, Variation: +/-25, Test Load / Ball: 3000kg / 10 mm, Block Size (diameter): 2" x 5-7/8"
Scale: HB30, Value: 500, Variation: +/-25, Test Load / Ball: 3000kg / 10 mm, Block Size (diameter): 2" x 5-7/8"
Scale: HB30, Value: 550, Variation: +/-25, Test Load / Ball: 3000kg / 10 mm, Block Size (diameter): 2" x 5-7/8"
Scale: HB5, Value: 75, Variation: +/-25, Test Load / Ball: 500kg / 10 mm, Block Size (diameter): 2" x 5-7/8"
Scale: HB5, Value: 125, Variation: +/-25, Test Load / Ball: 500kg / 10 mm, Block Size (diameter): 2" x 5-7/8"
Scale: HB5, Value: 175, Variation: +/-25, Test Load / Ball: 500kg / 10 mm, Block Size (diameter): 2" x 5-7/8"